In 1996 the Federal government lost the "Teal" Case, a Federal Court case jointly brought by HREOC (Australian Human Rights and Equal Opportunities Commission) and a number of asylum seekers held in the Port Hedland detention centre. Within a week, Prime Minister Howard's Immigration Minister Philip Ruddock produced legislation (The Migration Legislation Amendment Bill No.2 1996) that made it illegal for HREOC and the Commonwealth Ombudsman to offer unsolicited independent legal advice to detained asylum seekers. This "cat and mouse game" where Federal politicians take manipulative action to draft laws in defiance of the courts is always keenly supported - if not initiated - by the Immigration Department, and it is deeply entrenched in Australian asylum seeker politics. Curiously, the government or Immigration Minister invariably and euphemistically claims on such occasions that the legislation is "urgently needed to clarify the intent of the Migration Act". During May 2011 the Gillard government announced its questionable policy to "deport" boat arrivals to Malaysia in its "refugee swap deal", but it took just seven weeks for the Full Bench of the High Court to declare the policy unlawful. The Gillard government immediately responded by introducing laws (The Offshore Processing Bill) that would make its immoral policy not just permissible but also legal. However, fierce opposition by the conservative opposition, the Greens and other cross benchers combined to produce an outspoken condemnation of Immigration Minister Chris Bowen and Prime Minister Gillard's Malaysia plans, scuttling the passing of the laws in Parliament. An equally brazen political response to an impending court challenge against the Immigration Minister came when in September 2011 Legal Aid lawyers in New South Wales, Victoria, Queensland, Western Australia and the Northern Territory challenged the Migration Act vis-a-vis Australia's People Smuggling Legislation. Arguing that the law does not prohibit smugglers from bringing into the country those who have a "lawful right to come to Australia", the lawyers simply stated that "if it's not illegal to seek asylum in Australia, then smugglers do nothing illegal in assisting asylum seekers to reach our country". While Victorian Legal Aid acted for 52 Indonesian men awaiting trial in Melbourne prisons, the case promised to be a test case with major implications for as many as 350 crew members awaiting trial under the People Smuggling legislation. The Gillard government responded just within the nick of time: one day before the courtcase was to come before the Victorian Court of Appeal, it rammed the Deterring People Smuggling Bill 2011 through the House of Representatives within 54 minutes. Its sole purpose was to stymie the courtcase - which was set to be won by the Legal Aid lawyers. On November 1, 2011, at 6:17pm the Minister for Home Affairs Brendan O'Connor introduced the Bill into the House of Representatives, and the laws passed at 7:11pm. However, before the debate concluded, Mr O'Connor quietly slipped away from the House before 7pm for a Press Conference in the courtyard. The legislation included a no less than 12-year retrospectivity clause. O'Connor's legislation would have been illegal "anywhere in the European Union, the United States, Japan, New Zealand or Russia", while this practice would be frowned upon by "countries like India, Indonesia, Pakistan, the Philippines and Iran" and many other nations (see Jeff Waters' article here). Minister O'Connor urgently needed a publicity hook to advertise and promote this nasty measure in a persuasive way, and that Tuesday evening he was in luck. All day Indonesian media outlets had carried a major story, supported by graphic pictures on television. A small boat with around 70 passengers, sailing from the sea port of Central Java's capital Cilacap (formerly known as Tjilatjap) had shipwrecked off the Javanese coast; dozens of passengers had drowned. As O'Connor told the reporters in the courtyard of Parliament House's Ministerial Wing, the 70 passengers had reportedly been on their way to Australia. Before O'Connor's press conference, it was an Indonesian story; after his press conference, the story became a front page story in Australia. The next morning, the nasty and opportune details of his laws had drowned in the media noise of the Indonesian shipwreck story. This page brings together a number of media stories surrounding the issues outlined above. The first part, Section One, contains media reports about the court challenge brought by Legal Aid Victoria, while Section Two deals with the Deterring People Smuggling Bill 2011. 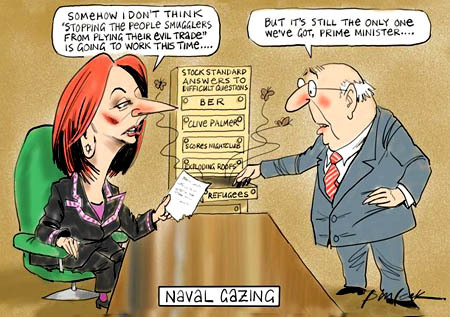 7 November 2011: Julia Gillard and Labor's factional warlords - The Gillard government's asylum politics in pictures. The raid on Kevin Rudd was not orchestrated by Julia Gillard, although she was a willing pawn in the ruthless raiding minds of the foolish apparatchiks in the right-wing factions of the Labor Party. Some members of these factions are known to have applauded John Howard and Philip Ruddock's merciless vilification of asylum seekers. A series of cartoons depicting the increasingly desperate political development vis-a-vis asylum seekers by the Gillard government. 6 November 2011: Australia's extra-judicial jailing of Indonesian children - We avoid the Criminal Code, because that would prevent us from jailing children without charges; we use discredited wrist X-ray testing to determine their ages without getting results in due time; while this goes on, our Immigration Department cowboys collude with Australian Federal Police in order to jail more than a hundred kids in adult Australian prisons. And barely anyone stirs this hornet's nest of Australia's medieval lock-em-up mentality. 5 November 2011: We're terrified of the boat people - We're terrified of the boat people: Children and boys are depicted as smugglers in Australia's psychotic war against boat arrivals. This is a page containing a number of media reports about the fate of those who sail asylum seeker boats to our shore. 16 April 2011: Island boys and Indonesian smuggling laws - Why did Indonesia formulate their anti-people smuggling laws? A massive political campaign has long told Australians that people smugglers are evil, that they are the scum of the earth, that they run a vile industry. That campaign has run in tandem with one convincing us that those sailing to Australia are 'illegal immigrants', 'queue jumpers' or 'economic forumshoppers'. 19 April 2010: The 2010 Anti-Smuggling Legislation - Punishing smugglers, or finding a covert way to lock Australia's borders? "In view of commitments given by Australia under the UN Refugee Convention, also to refugees arriving by boat, this legislation gives the appearance of being highly manipulative in nature." Australia's migration laws could be unravelled by a landmark legal challenge in Victoria arguing alleged people smugglers are lawfully entitled to assist refugees seeking asylum. Lawyers acting for 52 Indonesian men awaiting trial in Melbourne prisons say their clients are poor fishermen tricked or coerced into assisting organised smugglers. Some have been detained here for as long as a year and face mandatory five-year prison terms if found guilty. But Victoria Legal Aid is considering launching a test case that if successful could see hundreds of men being held for aggravated people smuggling under the Migration Act freed from detention here. Legal Aid solicitor Gavin Green said the accused smugglers were arguably entitled to bring asylum seekers here and should be acquitted. ''Under various international conventions the passengers on these boats have a lawful right of entry to Australia to have their refugee claims determined,'' he said. Mandatory penalties for aggravated people smuggling do not apply where those people had a lawful right of entry to Australia. Prosecutors must prove the accused knowingly organised or facilitated a group of five or more people to arrive in Australia and were aware of a substantial risk the passengers had no lawful right of entry here. But one of the alleged smugglers in Melbourne's remand centre told The Sunday Age through his interpreter he was recruited for about $300 to work on the boat and was not told who his passengers were or that their destination was in Australian waters. ''I didn't know what we were doing was illegal. As I saw it my job was to cook and operate the pumps,'' he said. The Commonwealth Director of Public Prosecutions declined to comment on a possible legal challenge. Prime Minister Julia Gillard has described smuggling as an ''evil trade'' perpetrated by people ''who seek to profit on human misery''. The 52 men aged between 19 and 64 in detention in Melbourne were flown here from Darwin due to the large influx of alleged smugglers in the Northern Territory. Twelve of the men will appear in the County Court for a directions hearing on August 30, while another 18 face contested committal hearings from August 5. A further two accused, who claim to have been minors at the time of the alleged offence, are in immigration detention, awaiting an official determination of their age. The mandatory detention laws do not apply to minors, four of whom have been deported from Victoria to Indonesia this year. The Sunday Age provided a list of questions, through lawyers, to several Indonesian fishermen held in Melbourne's remand centre. One man in his 20s said he was recruited by a stranger for about $300 for a week's work as a cook on a cargo boat to Ashmore Reef. ''I asked the captain if he knew where Ashmore was but he didn't tell me where it was,'' he said. One night offshore a group of about 50 asylum seekers were ferried on board. The captain left on a separate boat back to Indonesia near Australia's maritime boundary and told the remaining crew to sail south, where they were detained by Australian officials. A 28-year old fisherman detained about a year ago near Christmas Island said he was part of a three-man crew transporting 86 asylum seekers to an island he thought was part of Indonesia's archipelago, in exchange for about $US1100 ($A1015) and a boat on their return. Legal documents in the case show many of the refugees from Iran, Afghanistan and Tunisia paid more than $US10,000 to the alleged ringleader, who did not board the boat. The maximum penalty for aggravated people smuggling is 20 years' imprisonment or a $220,000 fine or both. Courts must impose a mandatory minimum five-year prison term for adult offenders, with a non-parole period of three years, or eight years for a repeat offence. A Queensland judge last month criticised such sentences as severe, after jailing two men who helped bring refugees to Australia from Indonesia. A group of Legal Aid lawyers says it is preparing for yet another possible High Court challenge to the immigration regime. It could be another setback for the Federal Government which is struggling to resurrect its Malaysia asylum seeker swap deal. Legal Aid lawyers in New South Wales, Victoria, Queensland, Western Australia and the Northern Territory are cooperating in the landmark immigration case which could free about 350 alleged people smugglers who face mandatory prison sentences in Australia. They are all watching a case which is soon to be heard by the Victorian Court of Appeal. Saul Holt is the Victorian Legal Aid lawyer leading the case soon to be heard there. He is representing more than 50 men accused of people smuggling. Mr Holt says the case is likely to end up in the High Court. Central to his team's argument is that if it is legal for prospective refugees to claim asylum in Australia, then it should be legal for people to bring them here. "This is a question of law, not a question of politics. We represent in Victoria 53 young Indonesian fishermen from coastal Indonesian villages who were recruited as crew onto these boats," he said. "These are not what the public would often think of as being the organisers of people smuggling rings. These men are just as much a part of the people smugglers' business model as any other part of this operation is. "None of the actual people smugglers are silly enough to find themselves in Australia, subject to minimum mandatory sentences of three and five years' imprisonment. So this is really a question of law." Mr Holt says the men deserve proper representation in the courts, just as any Australian would want if they found themselves arrested in another country. "Our obligation is to represent these young men and make sure they get a fair go in Australian courts with a proper interpretation of the law," he said. "That's what we're providing to these young men in Australia, who can't speak the language and are charged with offences they don't understand in a system they don't understand. "We're assisting them through that in the best way we can." Rachel Ball from the Human Rights Law Centre in Melbourne says it is unfair for these hundreds of young men to face mandatory jail terms. She says many of the men before the court are not leaders of people smuggling rings. "What that means is that the court isn't able to distinguish between the organisers of people smuggling operations and the crew on the boats," she said. "Only six of 353 cases where people are being arrested and charged under people smuggling laws have involved the organisers of people smuggling operations; the rest have been crew on boats. "So, they're young boys and men who have been offered a small amount of money to do jobs like cooking rice." Ms Ball has defended Legal Aid's move to represent the men. "It's proper that Legal Aid be funded to defend cases where people are facing years in prison, and it's required - both under international and domestic law - that that be the case," she said. A spokeswoman for Federal Justice Minister Brendan O'Connor says it is not appropriate for the Minister to comment on matters before the courts. Meanwhile, the Federal Government is also facing new opposition to its Malaysia solution. In a submission to a Senate inquiry into the scheme, 14 of the country's leading refugee law experts from a collection of major universities have advised that the Malaysia deal is unlawful under international law. The Northern Territory Supreme Court has ruled that people smugglers intercepted more than 19 kilometres off the Australian coast before June last year have not broken the law. Justice Jenny Blokland has ruled that to commit an offence against the Migration Act, people smugglers must bring asylum seekers without visas into Australia. She has decided that means bringing them into Australia's territorial sea within 12 nautical miles of the Australian coast. Justice Blokland has dismissed people smuggling charges against an Indonesian, Ahmad Ahmad, who was caught bringing 49 asylum seekers towards Australia in May last year because he was intercepted beyond Australia's territorial waters. The ruling could be used as a precedent to challenge other charges and convictions of people smugglers. But it only has implications for smugglers intercepted before the end of May last year, when the Federal Government changed the law. The Australian Lawyers Alliance says the decision could lead to similar convictions being overturned. Lawyers Alliance head Greg Barns says other people convicted of people smuggling could use the case as grounds to appeal. "This may open the Commonwealth up for claims of false imprisonment, it may certainly open the Commonwealth up to claims for compensation....under these laws," he said. The lawful right of refugees to come to Australia will be tested in New South Wales's highest court as part of a challenge to Australia's people smuggling laws. A lawyer for an accused people smuggler says his client had not committed a crime because the people he was transporting by boat to Australia had a right to come and apply for refugee status under international laws. Barrister Michael Crawford-Fish is challenging a decision by a District Court judge to allow a jury to determine the case against his client. He says the prosecution has failed to prove the passengers had ''no lawful right'' to come to Australia. In the case before Sydney's Campbelltown District Court last month, the court heard that the vast majority of the Afghan passengers brought to Australia from Indonesia by the accused, have been assessed as genuine refugees. One had also been assessed as a refugee by the UNHCR before the journey. Mr Crawford-Fish said people had a right to come to Australia under the Refugee Convention and claim asylum and Australia had an obligation to protect them. ''The Refugee Convention requires much more of us than simply requiring that people seeking our protection from asylum carry a visa,'' he said. This right to seek asylum was also protected in the Migration Act, he said. But Acting Judge Rodney Madgwick refused the application for a directed verdict and allowed the case to continue, saying he could not see the distinction between the words. ''The convention clearly contemplates that there can be illegal entry by a bona fide refugee. What would it be illegal under? Answer: the domestic law of the host country,'' he said. He argued the rights to protection under the convention only came into operation once the asylum claim had been established. Judge Madgwick said he believed the argument by Mr Crawford-Fish was widely contradicted by other decisions. The Sydney District Court heard last week that an appeal of his decision has been filed with the Court of Criminal Appeal. The case is likely to affect other cases before the courts, and the argument, which might be destined eventually to the High Court, matches a similar case before the Victorian and Northern Territory appeal courts. Most states are now hearing cases against alleged people smugglers, who tend to enter Australia off WA and the Northern Territory, to help reduce a backlog. Two courts in NSW have been assigned to the Commonwealth cases, but the Chief Justice of the District Court Reg Blanch said last week that he expected all available courts to be booked out for 2012 by the end of this year. Labor and the Coalition are co-operating to shore up laws that make people smuggling illegal. But the Australian Greens say the move is yet another attack on asylum seekers being pushed through parliament without proper scrutiny. The lower house passed a Bill to clarify laws that criminalise people smuggling this evening. It will apply retrospectively to when the Migration Act was changed by the Howard government in 1999. "The effective prosecution of people involved in organising and facilitating these inherently dangerous voyages sends a clear message that the Australian parliament does not tolerate people smuggling," Home Affairs Minister Brendan O'Connor told parliament. Greens MP Adam Bandt told the house the Bill was being pushed through so quickly to stop a court case that will be heard in the Victorian Court of Appeal later this week which challenges the people-smuggling laws. "Because this case is coming up we now have an instance where this bill is being rammed through without any proper scrutiny," he told parliament. "We have another instance of Labor and the Coalition working together to diminish the legitimate right of people coming to this country to seek asylum." Independent MP Rob Oakeshott also expressed concerns about the speed with which the legislation was passed. Mr O'Connor said there had been "significant consultation" between the Government and the Opposition and Greens regarding the Bill's importance. Mr O'Connor was at pains to say the Bill did not affect the rights of people seeking asylum, only those who try to make profit from bringing them to Australia. Opposition border protection spokesman Michael Keenan said it was "clearly important" for the meaning of the law to be clarified. His colleague, immigration spokesman Scott Morrison, said while there was disagreement between the major parties about how to deal with boat arrivals, there was agreement on this point. "It's people smugglers who are responsible for deaths at sea," he said. "It is not illegal to seek asylum; it is illegal to enter Australia without a valid visa." The Deterring People Smuggling Bill 2011 passed 54 minutes after it was introduced into the House. It now goes to the Senate for approval. The government and the Coalition can agree on the bad guys, conspiring to rush through retrospective laws to firm up the definition of a "people smuggler" in the face of a court challenge. But when it comes to the victims -- and this latest tragedy again proves that is exactly what asylum seekers are, the victims -- the parties keep up their petty squabble, draped with a cloak of sympathy and moral indignity. There is real poison here. Kim Beazley was nailed back in 2001 when he claimed the sinking of a boat carrying more than 530 people was a "failure of policy" and the two parties were yesterday careful not to fall into the same trap. But they certainly hoped the other might stumble in. Home Affairs Minister Brendan O'Connor appeared last night with a sombre message and a barely concealed barb. "This is tragedy," he said, "something that the government foretold." But he won't say if Labor is working on a Plan B. Malaysia is the only deterrent according to "the best advice" and "some bipartisanship" was needed to stop this terrible trade. Out trotted opposition immigration spokesman Scott Morrison to affirm this is a terrible tragedy, for "those who have survived and the families of those who have tragically been lost." But he won't be engaging in a political discussion, he said. No, "our record on these matters goes back over a decade." So this is the impasse. Labor wants its Malaysia swap and the Coalition won't give it. In the meantime, people -- either too desperate or too foolish to know better -- will believe the people smugglers' false promises of safe passage to Australia on wretched, leaking boats. Some solution. MARK COLVIN: Legislation hastily introduced by the Federal Government last night to amend people smuggling laws retrospectively has all but dashed the hopes of lawyers representing accused people smugglers. The Victorian Court of Appeal has adjourned a test case, in which legal aid lawyers were arguing that bringing people to Australia by boat was legal because the passengers have a legal right to seek asylum. To use the Government's language, last night's amendment, retrospectively clarifies the existing laws on the issue. If it passes, legal aid lawyers say it will scuttle the particular case in court today and almost certainly lead to the prosecution of 350 other men. MARY GEARIN: Saul Holt is senior public defender for Victoria's Legal Aid. He's been helping to argue the case before the Victorian Court of Appeal, for 20-year-old Jeky Payara, an Indonesian man charged with people smuggling offences. Until last Australian migration law said it was illegal for someone to bring to Australia people who "had no lawful right to come the country". Jeky Payara's defence was that a number of domestic and international laws said people did have a right to seek asylum, so anyone bringing them in, had done no wrong. But last night's amendment makes it illegal for people to bring in anyone without a valid visa. Saul Holt says if it's passed, this amendment would mean the end of this case. SAUL HOLT: Upon its face at the moment the new legislation renders this point irrelevant, so the new legislation targets this case specifically and it means that our argument can't win, because legislation is passed retrospectively to apply to all historical cases of people smuggling, to say that a lawful right to come to Australia is only related to the holding of a visa. MARY GEARIN: The amendment is retrospective and would apply to cases dating back to 1999. SAUL HOLT: Retrospective legislation has happened on a handful of occasions in Australian history, only recently in relation to social-security prosecutions; a similar step was taken by the Federal Parliament. Retrospective criminal legislation is not allowed under Victoria's Bill of Rights, nor under America's constitution, nor in most other common law countries. You'll understand why; people should be able to be prosecuted for offences that actually existed at the time that they were said to have been committed. It's a matter of basic fairness. MARY GEARIN: If the amendments go through is there any potential argument that you could say that if some of the asylum seekers were found to be refugees that there was some sort of retrospective status that they had that could protect the people smuggler? SAUL HOLT: No. This legislation has been drafted carefully in order to avoid any of the arguments that we were seeking to make in this case. But it's important to remember who these people are; these are impoverished Indonesian fishermen. They are not as is still being portrayed today by certain sectors; they are not highly organised wealthy people smugglers. Of the 350 people who have been prosecuted in Australia only a very small handful are organisers, the rest are as much victims of the people smugglers as anyone else. MARY GEARIN: Pamela Curr for the asylum Seeker Resource Centre says the case is just about doomed. PAMELA CURR: You've got the Opposition and the Government together, the Greens and the independents can't stop it; it will go through the Senate, they'll probably rush it through tomorrow to make damned sure that they get around the courts. This legislation will catch the small fish and leave the sharks marauding around the ocean. Just this morning I had a call from a very distressed Iraqi man. His family were drowned in a boat that went down last year. He said, I've been to the AFP over and over. I've given them the man's name, I've given them photographs, I went to Indonesia; I saw him. And he said why is he still free? Why is he still free when my family are dead? The people that this legislation catches are the kids cooking the rice on the boats and the poor fishermen who just sail the boats along. They don't even know half the time what their cargo is when they get on board. MARY GEARIN: This will affect the cases of about 350 people scheduled to be tried for people smuggling over the next year or so. This appeal has been adjourned till the end of the month to see what happens in the Senate. The grotesque nature of the bill that has been passed in Australia's Federal Parliament clarifying the terms of people smuggling reveals yet again how a governing body, without the restraint of a bill of rights, can run rough shod over fundamental rules of law. Not even common law fetishists could deny that a retrospective law on criminal matters is an appalling thing at the best of times and should be stopped, if not rendered beyond the power of Parliament. A most blatant exercise of that power was made over the last two days. It all centres on the case of 20-year-old Jeky Payara, an Indonesian man accused of people smuggling and defended by Saul Holt, a senior public defender for Victoria's Legal Aid. Until the present bill's amendment to the Migration Act 1958, Australian migration law said it was illegal for someone to bring to Australia people who 'had no lawful right to come to the country'. The premise of the challenge made by Holt was that one cannot commit an illegal act when assisting individuals to fulfil their legal rights to seek asylum. Suddenly, the problems of the Migration Act, already subjected to the closest scrutiny with the High Court decision in August on the Malaysia solution, have come back to haunt the Government. The Gillard Government clearly wishes to see the Payara case collapse. To this end, it has drafted retrospective legislation punishing what was previously legal. This clearly violates a key precept of the common law, not to mention various human rights declarations that dot the international law landscape. This is commonly called the ex post facto rule or the rule against retroactivity. The principle has a rich history, finding expression in the Latin expression nullum crimen sine lege, nulla poena sine lege, a principle formulated by Feuerbach and included in the 1871 German Penal Code and the Weimar Constitution. The American Constitution openly prohibits ex post facto laws in Article 1, section 9(3), and article 15 of the International Covenant of Civil and Political Rights makes a similar proviso. Both include the qualification that trial and punishment of a person can still occur provided that the act or omission 'was criminal to the general principles of law recognised by civilised nations'. History can point to a few key cases when such retroactive approaches were deemed legal, sometimes because of the exceptional circumstances of the crimes, sometimes because a government had simply overreacted. The Nuremberg Trials were an example of the former. The decision of the House of Lords in Shaw v Director of Public Prosecutions (1961) is an example of the latter; the House of Lords contrived to punish Shaw for the non-existent crime of conspiracy to corrupt public morals. One might argue, as was done at Nuremberg, and subsequently in the Australian High Court case of Polyukhovich v The Commonwealth (1991), that the defendants would still have been punished under traditional war crimes accepted as such by the community of nations. In a sense, the injunction against retroactivity may be a fiction. Judges abide by that happy fiction by claiming with pious conviction that they interpret rather than make laws. Unfortunately, a party who believed that what they did under old interpretations was correct, may well find that an offence or breach has, in fact, taken place. The law of precedent is not always a stable one. The Government line has been that people smuggling constitutes a grave crime and deserves harsh punishment. Closer inspection of this betrays such a line as misguided. The individuals who are being charged for people smuggling are often penniless teenagers who are themselves part of the process of funnelling people through various transit points in order to seek legitimate asylum. They are hardly, as Australia's foreign minister Kevin Rudd would have it, 'scum of the earth' engaged in the world's most evil trade'. Whatever the case, this episode shows yet again how dangerous parliamentary absolutism can be. The same body has already made retrospective laws with regards to social-security prosecutions. Nothing is too serious. Instead of allowing a logical, carefully argued legal principle to be made, the Government has decided to pull the carpet from under the judiciary. Retrospective People Smuggling Bill: a Breach of our Constitution? The major parties put aside their differences on immigration policy in the House of Representatives last week to pass the Deterring People Smuggling Bill 2011 (the Bill). Despite its name, the Bill is a 'clarification' of the people smuggling offences in the Migration Act 1958 (Cth) designed to make successful prosecutions easier. Currently, the law does not prohibit smugglers from bringing into the country those who have a 'lawful right to come to Australia'. Essentially, the Government seems to be concerned that the courts might say asylum?seekers (as potential refugees) have a lawful right to come to Australia, which could scupper several high?profile people-smuggling prosecutions currently under way. The Bill was subsequently sent to the Senate, which referred it to the Legal and Constitutional Affairs Committee so it could be subjected to at least a modicum of scrutiny. An examination of this Bill reveals that it probably has the dubious distinction of being contrary to both Australia's international obligations and our constitutional separation of powers doctrine. The Explanatory Memorandum states that the existing offences of people smuggling are consistent with Australia's obligations under the Protocol against the Smuggling of Migrants by Land, Sea and Air supplementing the United Nations Convention on Transnational Organized Crime, but ignores article 19(1) of this Protocol, which specifically says it doesn't affect States parties' obligations (or asylum-seekers' rights) under the 1951 Refugees Convention. The Explanatory Memorandum claims that the offences as amended "do not affect the rights of individuals seeking protection or asylum in Australia. They also do not affect Australia's international obligations in respect of those persons." There are at least two problems with these claims. First, the Bill is likely to deter asylum-seekers (indirectly) as well as people smugglers, which is not in the spirit of the system of refugee protection created by the Refugees Convention (and reflected in the protection visa regime in the Migration Act). To argue that they can obtain visas to enter Australia and come by means of 'legitimate' commercial carriers is to ignore the reality they face - that such actions would inevitably invite (further) persecution by drawing the attention of the authorities they are fleeing, or even involve actual criminality such as identity fraud. Additionally, vessels operated by people smugglers have, over the past 13 years, transported thousands of people to Australia, the majority of whom have subsequently been found to be genuine refugees (up to 98% in the case of certain nationalities). It is therefore difficult to see how the claim that this Bill will have "no impact on individuals seeking protection or asylum" can be borne out in practice. Item 2 of the Bill provides that the amendments, if passed, will have effect from 16 December 1999 (when the phrase 'lawful right to come to Australia' was inserted into the Migration Act by the Border Protection Legislation Amendment Act 1999). . The Explanatory Memorandum states that "[t]he people smuggling offences in the Migration Act have been consistently interpreted since 1999 as applying where a person does not meet the requirements for coming to Australia under domestic law." This statement implies that no clarification is required, which leads to the conclusion that the Bill is either redundant or has the ulterior motive ofenlarging the people smuggling offences. Retrospective laws are prima facie contrary to the rule of law because they prevent people from knowing their legal rights and duties at a particular time. The Parliament technically has the power to enact such laws, but the Government's own Legislation Handbook makes it clear that "[p]rovisions that have a retrospective operation adversely affecting rights or imposing liabilities are to be included only in exceptional circumstances." This principle is also reflected in article 15 of the 1966 International Covenant on Civil and Political Rights (ICCPR), to which Australia is a party, which requires that the criminal law be applied as it stood when the offence was committed with only the narrowest of exceptions. In Polyukhovich v The Queen, the High Court considered one of these exceptional cases (legislation introduced in 1988 which retrospectively criminalised WWII war crimes under Australian law). Deane J considered that retrospective criminalisation was inconsistent with Chapter III of the Constitution, since it is the exclusive preserve of the judicature to determine criminal guilt according to the law [at 59]. Gaudron J concurred, finding the law to be a 'usurpation of judicial power' [at 41]. Toohey J agreed in principle, but contended that there could be exceptions for 'extremely grave' transgressions (such as war crimes - see para 108). Three Judges (Mason CJ, Dawson and McHugh JJ) in Polyukhovich found that the Commonwealth does have the power to enact retrospective criminal laws, while Brennan J did not decide on the matter. Therefore, the court split 3:3 on the matter, with Toohey J applying an exception which is probably not relevant to the law under consideration here. Unlike the law in question in Polyukhovich, the present Bill does not create any new offence. However, it arguably enlarges an offence retrospectively by removing a potential defence. The law may render an act - namely the unauthorised transportation of asylum?seekers (as opposed to other migrants) - criminal retrospectively and pre-empt findings of the courts in ongoing prosecutions. In the case of Nicholas v The Queen, Brennan CJ stated that "[a] law that purports to direct the manner in which the judicial power should be exercised is constitutionally invalid" [at 20]. The courts are presently engaged in the process of interpreting the phrase 'lawful right to come to Australia,' and the Bill arguably tells them how they should do this. Gaudron, McHugh and Kirby JJ, while reaching different conclusions on the facts in Nicholas, all agreed with Brennan CJ that such interference with the operation of the courts is impermissible. If there were any doubt about the intention to intervene in the judicial process, the Bill provides specifically in item 2(2)(b) of Schedule 1 that the amendments are to apply to proceedings in train (including appeals). In the relevant cases/appeals, the issue of refugees' and asylum?seekers' 'lawful right to come to Australia' has been raised in defence of accused people smugglers. Under ss 233A, B or C of the Migration Act, these accused persons face penalties of up to 10 or 20 years' imprisonment. Since the Bill would effectively decide the issue raised by the defence in these cases, it clearly has the potential to affect the defendants' liberty seriously. In the context of both the presumption against retrospectivity and the doctrine of separation of powers, these amendments constitute dubious law which may well be constitutionally invalid. The Law Council of Australia and Law Institute of Victoria have reached similar conclusions in relation to the Bill. At best, this Bill is redundant. If it is not, it may contravene Australia's international obligations and the Constitution. Regardless, it should be withdrawn. The Scum of the Earth? As an aside on prosecutions of people smugglers more broadly, the Government's rhetoric casting the defendants in the role of 'scum of the earth' who should 'rot in hell' may be misguided. Joshua Kelly, an intern at Australian Lawyers for Human Rights, last year published a paper in which he observed that the Australian definition of a criminal people smuggler could apply to people who assist others to flee oppression for purely altruistic motives. The examples he gives to make his point are Moses, Oskar Schindler and Bruce Haigh (a diplomat who helped people flee the apartheid regime). Perhaps Raoul Wallenberg or Dietrich Bonhoeffer would be better examples. A recent SBS Dateline documentary also featured Hungarian smugglers who facilitated families' flight from the Soviets in the 1950s (including the family of presenter Les Murray). Such people, the documentary pointed out, sometimes take great personal risks to help others flee oppression, even if some have purer motives than others. Joshua Kelly's research found that many of those convicted of people smuggling offences were refugees themselves who were motivated by concern for others facing similar situations, which does not sit well with the Government's 'most evil' claims. Another problem is that many of those being prosecuted seem to be poor and/or young fishermen who are exploited by organisers who never set foot on the boats themselves. Still, there is clearly merit in prosecuting those who are truly responsible for (and profit from) a practice which results in tragedies such as the Christmas Island disaster of December 2010 and the more recent one off Java. The trick is not to punish the exploited along with the exploiters - this is where the Government's policy work should be directed. UPDATE 22 November 2011: - the Senate's Legislation Committee has just tabled a report on this Bill which recommends it be passed. This comes as no great surprise, given the two major parties support 'tough measures' against people smuggling. However, the Senators question the lack of clarity in Government rules and guidelines surrounding the introduction of retrospective legislation, and the Coalition Senators say they were "extremely disturbed by the lack of precision on the part of the relevant departments in evoking a clear case for retrospectivity" [para 1.8 of their Additional Comments] - ouch! The rapid passing of the Deterring People Smuggling Bill 2011 through Parliament on Tuesday November 1, 2011 coincided with the tragic sinking of a boat carrying asylum seekers off the south coast of Java. Unsurprisingly, blame for the tragedy has been directed squarely at unscrupulous, criminalised people-smuggling networks. This has provided political grist to the mill for both sides of Parliament wanting to project a hardline stance on border protection. The bill was rushed through Parliament to amend the Migration Act to thwart a test case on people-smuggling laws to be heard in the Victorian Court of Appeal on Wednesday. The case has now been delayed to give time for the new legislation to come into force. In short, the Victorian appeal argued that if asylum seekers have a lawful right to seek asylum in Australia (as suggested by the High Court ruling in August), then those assisting passage cannot be prosecuted as "people smugglers", which is based on the illegality of entry. However, this highly simplified framing of the people-smuggling problem is logically flawed on at least two accounts. First, it fails to acknowledge the reality of who is actually affected by the legislation. One might reasonably assume it to be crime bosses sitting back in safe affluence profiteering from human misery. This is the stereotype presented in popular discourse - Kevin Rudd's "absolute scum of the Earth". However, information revealed during the recent Senate Estimates hearings in October presents a starkly different portrait. Under questioning, the Deputy Commissioner for Operations in the Australian Federal Police, Andrew Colvin, revealed that of the 493 individuals arrested in Australia on people-smuggling charges during 2009, 2010 and 2011, 483 were simply working as crew on boats leaving from Indonesian ports. Only 10 individuals are organisers! So, those affected by the rushed amendments are in fact deckhands and cooks, many recruited from impoverished islands in Indonesia's eastern backwaters. In what is slowly looming as a national human rights disgrace, many of these crew members are juveniles being imprisoned in Australian adult jails: their ages determined by a questionable wrist X-ray examination widely discredited by medical authorities, including the Royal Australasian College of Physicians. Far from the vile scum of the political imagination, they are boys such as Ose Lani, Ako Lani and John Ndollu, all minors from Rote Island near Timor, who were offered jobs to work on boats leaving from their local harbour. Oblivious to the demonisation of "people smugglers" in Australia, they accepted and languished for months in Australian adult prisons before finally being released. Many more villagers just like them are still being detained in Australian jails, their fates further sealed by this week's bill. In a move strongly opposed by the Law Council of Australia, the legislation will be applied retrospectively to 1999 and includes harsh five-year mandatory sentencing for those assisting passage for groups of asylum seekers. In what can only be described as sloppy law-making, Australian people-smuggling laws do not differentiate between those individuals crewing boats for paltry wages and organisers reaping profits. The second flaw in logic is the dubious claim that harsh people-smuggling laws are required on compassionate grounds to avoid disasters such as that which occurred off Pangandaran last week. These disasters are occurring because asylum seekers are travelling on crowded, unseaworthy boats with inexperienced crew. Yet, unseaworthy boats are deployed because any vessels reaching Australian waters are routinely destroyed by our authorities. This creates clear financial disincentives to deploy productive (and valuable) boats and encourages overloading. Similarly, severe mandatory sentencing of crew automatically selects for inexperienced, uninformed, desperate or naive individuals, who are likely to be ill-prepared to safely navigate the passage to Christmas Island or Ashmore Reef. Those insisting on harsh people-smuggling penalties under Australian law, thereby shaping the disincentives for appropriate maritime safety, are equally culpable for deaths at sea. The flawed logic underlying the response to people smuggling reflects an inadequate conceptualisation of people smuggling itself. Foremost is the obfuscation of the terms "people smuggling" and "human trafficking". In its 2010 Global Review on The Smuggling Of Migrants, the United Nations Organisation Office on Drugs and Crime (UNODC) is quite clear that the latter involves profit obtained through exploitation at destination, whereas people smuggling does not. This is not the case with asylum seekers arriving in Australia and the term "human trafficking" should never be used or implied. The dominant international conceptualisation of people smuggling, as presented in the UNODC review, is a system of institutionalised networks with complex profit and loss accounts that facilitates movement of people between origin and destination countries. Smugglers are merchants while the smuggled migrants are clients paying for a service. Australian laws, then, contribute to the network of incentives and disincentives that shape behaviour and decision making amongst actors and agents across South-East Asia. While exploitation undoubtedly occurs within these networks, it is also not uncommon for asylum seekers themselves to refer to the person who "helped" them as an "agent". Indeed, family networks are sometimes implicated as in the well-known cases of Hadi Ahmadi and Ali Al Jenabi, suggesting altruistic motives play a part for at least some (but certainly not all) of the actors involved. The draconian sentencing and demonisation of impoverished Indonesian juveniles as "people smugglers" is a moral outrage. The same policy simultaneously contributes to unnecessary deaths at sea through sending clear safety disincentives to actors operating within the region. Jeffrey Neilson is a lecturer in geography at the University of Sydney, with specific expertise in economic development and poverty alleviation in eastern Indonesia, where many of the jailed Indonesians come from. MARK COLVIN: Lawyers groups have given a scathing assessment of the Federal Government's attempts to shut down a test case that would make it harder to prosecute people smugglers. Legal aid groups have argued before the courts that bringing people to Australia by boat is not necessarily illegal. The Government has responded by attempting to amend the Migration Act to shore up its legal position. But lawyers have told a Senate committee that the Government intervention is heavy-handed, and could actually expose it to further challenges in the future. Stephen Dziedzic reports from Canberra. STEPHEN DZIEDZIC: The Federal Government and the Opposition rushed the amendments to the Migration Act through the Lower House last week, but they have not yet passed the Senate. The retrospective changes would make it clear that anyone who brings in an asylum seeker without a valid visa is breaking the law, and will face a minimum five-year jail term if guilty. But Saul Holt, from Victoria's Legal Aid, has told a Senate committee the vast majority of people facing the charges are bit players and not high level criminals running people smuggling rings and they don't deserve such harsh treatment. SAUL HOLT: This Parliament has two extreme legislative steps that it can take. One is mandatory sentencing and the other is retrospective law. And it is entitled to do them both. But it should only do them when it really, really, really, really means it and when the circumstances of the offending are such that it should really be done. And the men that are targeted by these laws are not criminals. The men that are targeted by these laws who sit languishing in Australian detention centres and prisons are not the evil people smugglers to whom this stuff is addressed. STEPHEN DZIEDZIC: Mr Holt's representing a 20-year-old Indonesian man charged with people smuggling. He argues that under the current laws bringing people to Australia by boat is legal because they have a right to seek asylum. The amendments before Parliament would scuttle his argument. But Mr Holt says instead of doing all it can to defend the current unfair laws the Government should create new laws which specifically target high level people smugglers. SAUL HOLT: The six people who are currently prosecuted who are all being prosecuted who are organisers would also gain the benefit of this argument. I acknowledge that immediately. What it highlights, in fact, is the problem of making everybody liable to the aggravated people smuggling offence because no matter what they do, as long as there are more than five people, they're subject to mandatory terms of imprisonment. STEPHEN DZIEDZIC: The amendments would have ramifications for more than 300 other men who are also facing people smuggling charges. Jonathan Davies, from the Australian Lawyers Alliance, says the Government's proposal is offensive. JONATHAN DAVIES: A person should not be prosecuted for a criminal offence which was not in existence at the time of the relevant activity. It is offensive because it smacks of arbitrary government. STEPHEN DZIEDZIC: And he says that instead of resolving legal uncertainties, the amendments may actually create a legal minefield. JONATHAN DAVIES: I will guarantee you that this package is explosive with potential for litigation. A can of worms does not accurately describe it. The very fact that the legislation is being brought raises the question of the doubt in interpretation. I see simply that everybody that's sitting in jail now that's been convicted under this section and has exhausted their appeals should prepare an application to the International Human Rights Committee. And it will become an international embarrassment. STEPHEN DZIEDZIC: The Attorney-General's Department has published guidelines which say retrospective legislation should only be applied rarely, and to people who are morally culpable for their actions. The Liberal Senator, Gary Humphries, has grilled the Department's Iain Anderson on whether the amendments meet that test. GARY HUMPHRIES: I don't think you can avoid the policy issue behind that. IAIN ANDERSON: No Senator. In a situation where Parliament has said that these offences should be penalised by a 20-year maximum sentence and a five-year mandatory minimum sentence, we say that that's a serious situation. GARY HUMPHRIES: So are you saying that the moral culpability is determined by the fact that the mandatory sentence makes them morally culpable? IAIN ANDERSON: Senator I'm saying that people smuggling is viewed as definitely a very serious activity. It puts lives at risk. STEPHEN DZIEDZIC: The Greens Senator, Sarah Hanson Young, also had some questions. SARAH HANSON YOUNG: So including the poor Indonesian fisherman who's 19 years old, and has been tricked to board a boat that he thought he was going on a fishing trip for? IAIN ANDERSON: I'll certainly say that they're culpability is going to be less than that of an organiser. But I will also say that the Australian Government does have an offshore information communication campaign to seek to educate people in other countries about the dangers of people smuggling and about the risks. STEPHEN DZIEDZIC: It's not yet clear when the amendments will go before the Senate. It seems inevitable the Federal Government will soon be dragged back to the High Court on matters relating to immigration policy. Last time, it lost, and the so-called Malaysia Solution had to be scrapped. This time, if a group of lawyers has its way, hundreds of Indonesian men (and some say boys) who've been accused of people smuggling may have to be set free. It's a potentially explosive political situation that the Government is doing its best to avoid, and, this time, it's being assisted by the Coalition. The situation was underlined in a recent Parliamentary Committee Hearing in Canberra, which had been hastily called to examine new, and rare, legislation that had been introduced into Parliament in an attempt to stop the lawyers' action to try to free the men they describe as simple crew members. Jonathan Davies from the Australian Lawyers Alliance, who was audibly angry during his testimony by telephone from Sydney, told the committee in Canberra that this new legislation was "explosive with the potential of litigation." "A [legal] can of worms doesn't describe it," he said. The legislation in question is called the Deterring People Smuggling Bill 2011. In short, and in very lay terms, the new bill aims to make it illegal to knowingly transport anyone without a valid visa into Australia. Of course, that seems like an entirely reasonable thing, given this country's immigration regime, and wide community concerns about people smuggling. But this bill goes further than just about any legislation ever introduced into our Parliament, due to the fact it is retrospective in nature. That means that, in spite of the fact it was arguably not illegal to do such a thing before the act was introduced, its passing will render hundreds of people criminals who, at the time they arrived here, may not have been breaking any law. Retrospective legislation is a blunt instrument which is usually avoided for obvious reasons. For instance, how many Australians could be imprisoned if it were to be ruled that taking Aboriginal children from their families was - retrospectively - illegal? Such legislation is usually only introduced in extreme circumstances, the most cited example being when this country ruled retrospectively to make war crimes committed in the past illegal. Indeed, it is illegal to introduce retrospective laws with criminal sanctions in most developed countries. It can't be done anywhere in the European Union, the United States, Japan, New Zealand or Russia. Even countries like India, Indonesia, Pakistan, the Philippines and Iran (and many more) find it too backward a step. So why did the Australian Government deem this situation to be so serious as to warrant retrospective laws? It all started when an unofficial alliance of Legal Aid lawyers from most states and territories started talking together, and decided on a radical, yet extremely simple, argument to defend their often youthful Indonesian clients. With the Victorian Legal Aid centre leading the charge (and making the first legal arguments in a court) the lawyers argued before a County Court judge that if it is legal for a person to come to Australia and claim political asylum, then why should it be illegal to bring them here? They won their first test. The County Court judge sent the matter to the Victorian Court of Appeal. Apparently mindful of the fact this uncomplicated yet weighty argument might see them beaten, once again, in the courts, and with hundreds of similar cases lined up and waiting for a convenient precedent to be set in this case, the Government chose to act with legislation. Sure, they could easily change the law so that anyone bringing someone knowingly into the country without a proper visa could be locked up, but they would have to make this rule retrospective so as to ensure all of the current accused stayed in jail. Naturally enough, when the Senate Legal and Constitutional Affairs Committee was asked to conduct a rushed review of the legislation, it was, also naturally enough, set upon by all manner of legal and civil liberties organisations (about a dozen of them) which were highly critical of the new bill. We object to the attempt made in the bill to retroactively criminalise the behaviour of so- called people smugglers. People are entitled to certainty about what the law requires of them; but retrospective laws are arbitrary, and deny them that certainty. Imposing criminal sanctions on people for doing what was legal when they did it is necessarily unjust. reiterates concerns with the way the bill has been seemingly rushed through the House of Representatives... [without] proper parliamentary scrutiny. While we are concerned with any attempt to enact retrospective laws on the basis that individuals cannot be expected to adhere to a law that did not exist at the time the action took place, we are particularly concerned when a dispute governed by the legislation is awaiting determination before the courts. And that's where the Government might find itself hoisted by a judiciary which has never looked kindly on attempts to legislate away its powers. This retrospective legislation seems clearly tailored to kill legal proceedings which have not yet been finalised. So as to win a court case (or perhaps have that case thrown out) the Government simply introduced legislation to ensure that any applicant was undoubtedly guilty. That's fine if the Victorian Court of Appeal is the highest court in the land, but it's not. The constitutionality of the Government's actions may very well be challenged in the High Court, as alluded to by Mr Davies above. As the principal Victorian Legal Aid lawyer running the case, Mr Saul Holt would not be drawn on any such speculation about possible High Court action. But, in an interview with me, he was certainly willing to join in the criticism of the retrospective legislation, introduced while a Court of Appeal case was still underway. "It was a long standing convention that the parliament makes laws and that the courts interpret those laws, but the more important thing here is the Commonwealth - the government - is a party to this litigation, to this court case and essentially what this means is that they are changing the goal posts half way through," he said. "It's really just a matter of fairness and getting these proceedings done appropriately." I asked Mr Holt, however, if he could see the Government's political reasoning, given the fact that, if these men are all set free, a clear deterrent to people smuggling may have been removed. "I can understand the concern but you've got to understand who the people actually are," he replied. "We are not talking here in Australia about the true people smugglers; the true organisers." "The people who are locked up in Australian prisons - the vast majority of them are poor Indonesian fisherman who get recruited onto boats, often misled in that process." "Because the people who end up in Australian waters on these leaky boats are not the true organisers, why would they ever want to get themselves into that position?" I asked Mr Holt about his reasons for criticising the retrospective nature of the new legislation. "Well retrospectivity is something in criminal law which is done very, very rarely," he said "and that's for good reason. "It's a matter again of basic fairness. "You shouldn't be prosecuted for a crime that didn't exist at the time that you did the act that made up the crime. "You can't control your own behaviour if you don't know what the criminal law actually is. "So the whole point is about retrospective legislation that there should be very good reason for doing it, and Parliament set its own standards for that," Saul Holt said. "It says we should only have retrospective legislation where there is true moral culpability, where there is a very good reason for doing it." The Government obviously does think it has a good reason for introducing the new bill, which could be described as legally exotic. It's convinced the Opposition and, given the lack of public debate on this issue, also appears to have convinced the public and much of the media. But will it convince the high judiciary? If not, and if a challenge is successful, it may very well be left to manage another terribly embarrassing court decision. Jeff Waters is the Senior Journalist in Victoria for ABC News. MARK COLVIN: Federal Parliament has passed laws designed to shut down a legal challenge to the Government's people smuggling laws. Lawyers argued under the old laws that it might be legal to bring people to Australia by boat. But the major parties have voted together in the Senate to pass amendments to the Migration Act that shore up the Government's legal position. The Government says it's simply clarifying what the laws mean, but the Greens say it's an outrageous breach of the separation of powers. Stephen Dziedzic reports from Parliament House. STEPHEN DZIEDZIC: Legal aid groups representing a young Indonesian man charged with people smuggling have challenged the Government in the courts. They've argued that bringing people to Australia by boat may not be illegal, because those on board have a right to seek asylum. But the Senate has just passed amendments that scuttle that argument, by stating unambiguously that anyone who brings in an asylum seeker without a valid visa is breaking the law, and will be jailed for at least five years if guilty. The Government argues it's simply clarifying the intent of laws it's already passed, but the Greens Leader, Bob Brown, says it should not be meddling in a court case it's involved in. BOB BROWN: What we're dealing with here is the Parliament at the behest of the Government, which is prosecuting individuals held in Australian jails, passing a law so that that prosecution can be, case can be altered in favour of the Government and against the people under charges. This is outrageous, it's appalling. STEPHEN DZIEDZIC: Lawyers groups also say the retrospective amendments could actually expose the Government to further legal challenges in the future and they argue the vast majority of people smugglers caught are small time players, so the amendments will simply ensure they receive an unfair and punishing mandatory sentence. The Greens Senator, Sarah Hanson-Young, has grilled the leader of Government business in the Senate, Joe Ludwig, about the changes. SARAH HANSON-YOUNG: We know that this is the reason primarily why the Victorian court case has been brought forward, because of the complications that that is creating in not catching the king pins, the big fish, but instead using the small fry, the Indonesian fishermen who have been tricked onto these boats, as the scapegoats. I'd just like to ask the Minister, give the Minister an opportunity again to put on the record exactly the evidence that the Government has that the current legislation has indeed deterred anybody. JOE LUDWIG: Thankyou. Can I put it simply in this way - that having an affective offences regime is a deterrent. STEPHEN DZIEDZIC: But the Liberal Senator, Ian MacDonald, has accused the Greens of hypocrisy. IAN MACDONALD: For every person that comes in illegally by boat, someone living in a squalid refugee camp somewhere in the world is put back another year. That seems to be okay as far as the Greens go. If you happen to be a wealthy person, and I know, and the Greens have shown quite often in the last few weeks, that they are for the big end of town, for the wealthy people. STEPHEN DZIEDZIC: The Liberal Senator, Gary Humphries, says it's reasonable to pass the amendments because most MPs do believe people smuggling should be illegal. GARY HUMPRHIES: An attempt is being made to represent the will of Parliament through earlier legislation as being different to what it actually is and therefore clarifying what the Parliament intended when it passed earlier legislation in 2010 is an appropriate exercise of the clarifying nature of retrospectivity in this context. STEPHEN DZIEDZIC: But he also says the Government may have created a problem by drafting the original legislation poorly. The Attorney-General's Department has issued guidelines that say retrospective legislation should only be applied rarely and to people who are morally culpable for their actions. Senator Humphries says it's not clear whether the amendments meet that test. GARY HUMPRHIES: There is some evidence that some of the people involved in people smuggling are not particularly aware of the nature of the offences that they are committing. They are probably small operatives in a process of which they're not fully aware of the implications of what they're doing and that moral culpability might not be very evident. The lack of an ability to clearly characterise the case for retrospectivity by officers of the Attorney-General's Department was quite frankly troubling. STEPHEN DZIEDZIC: The legal aid groups challenging the Government say it's now very likely that they'll drop the case.